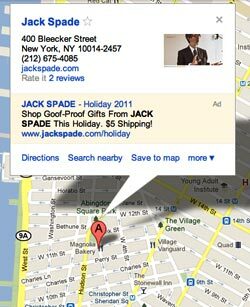 Just in time for the holiday shopping season, Google has been quietly adding new ad placements in some of its most popular search destinations throughout the fall: maps. Spend time walking around New York’s Fifth Avenue, Chicago’s Magnificent Mile or San Francisco’s Union Square and it’s easy to see the growing dependence on Google maps, especially as people stop abruptly in front of you to consider the search results on their smartphones. But what’s relatively new in the Google Maps app is sponsored ads that appear automatically among all the little red pins indicating your search results. Say you’re looking for a restaurant in the area you’re in. Google will show you a map with a bunch of little red pins indicating your choices. One restaurant, however, automatically has its brand poking out in a flag with a subtle little “Sponsored Link” written underneath. It’s a pretty powerful way to literally stay above the fray. 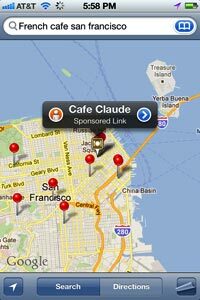 And because the little red pins don’t indicate anything other than location, it’s a great way to pop your brand out from the pack and inspire that first click. Another way Google has increased ad inventory is by adding an ad unit to the pop-up bubble in Google Places and Maps via the browser. This is a great way for folks with special deals -- say, on Cyber Monday -- to insert those at the point at which someone is considering visiting a brick-and-mortar location. It’s also a good way to bid on a competitor’s branded keywords and to insert your offer even as someone is considering your competitor. Online retailers, for instance, can show lower prices or free shipping for items a customer might otherwise buy in person and schlep home on the bus. Take a look at this pop-up for Jack Spade on Bleecker Street in New York. The retailer has shrewdly bid on its branded keywords in Maps so that its ad appears under its Places listing. The company hedging their bets in case I decide not to visit the store in person, offering me $5 shipping for any orders I place online. If you haven’t added Maps and Places to your Google advertising mix, you should. Defending your branded keywords is critical to avoid competitors or other hostile forces from advertising under your results. Moreover, using the mobile app to stand out from what is almost always a crowded results pack will increase click-through rates and conversions. The mobile app ads, in particular, look like they’ll be highly effective based on some initial tests I’ve seen, so do some of your own right away. 1 comment about "Google Ads Popping Up In Maps ". Dave Oremland from PBSpitt, November 29, 2011 at 8:17 p.m. Interesting perspective. Mobile is especially potent and especially potent in major urban areas. Your suggestions are powerful. On the other hand, small businesses have raised their voices with concern relative to the "google bubble" in places. Their concern is that ads for competitive businesses can appear on a page they consider their own. In fact Google's efforts to get smb's to "claim a places page gives smb's the impression..."it is their page". Obviously its not..its google's page as we see via the placement of ads. I wonder if this plethora of ads will disappear after Christmas. These days they are everywhere! !